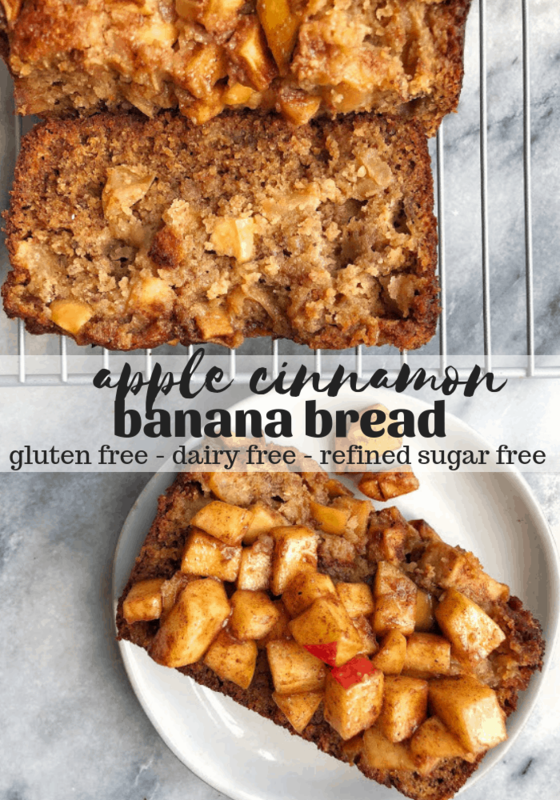 Healthy Apple Cinnamon Bread — a cross between moist apple cake and banana bread. Made with a mixture of gluten free flour, honey, and juicy apples. The perfect healthy fall recipe! Yep. 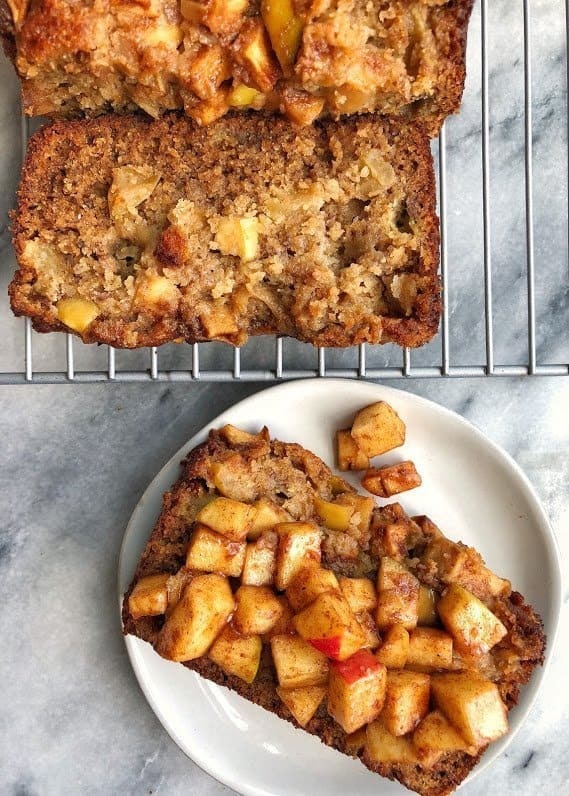 Sign me up for making this healthy apple cinnamon bread for the rest of my life. I like to call this bread a happy accident, a good mistake, a successful experiment. I went to make my standard cinnamon roll banana bread and then saw some of the apples that I had sitting on the counter. I instantly started thinking about how I could use them that day because we were leaving for vacation and then it came to me that I needed to add them to this bread. 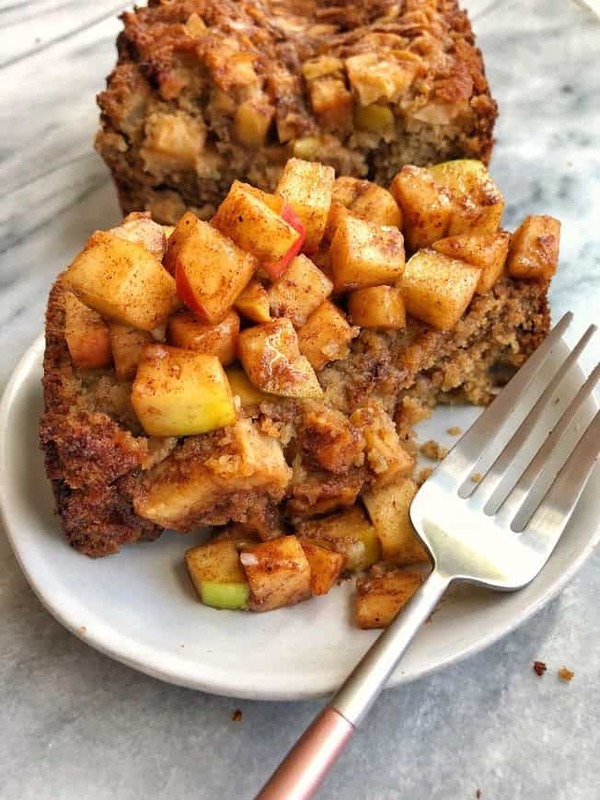 A healthy apple cinnamon bread. 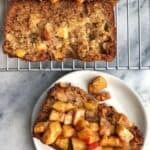 A beautiful marriage between apple cake and banana bread, but with cinnamon and so much goodness. Doesn’t that sound pretty good to you? I brought the first rendition over to my girlfriends when we were all hanging out a few weeks ago, and even though there were plenty of things that I wanted to tweak with it, they all raved about it. So I knew I had to make it again until I got it perfect, because no matter what, I always feel better when I feel 100% confident in a recipe, instead of just 75% confident. So now that it is officially fall and the weather is really starting to turn, and the leaves are changing colors, nothing really screams autumn than a comforting loaf of warm apple bread. Made with some of nature’s best ingredients because that’s what we do here over at Erin Lives Whole. Natural, good for you, satisfying, nutrient dense. So go ahead and make this bread and eat it for breakfast, top it with cinnamon sugar apples for an added punch, pack it up for your afternoon snack or even throw a scoop of vanilla ice cream on top for dessert. That sounds pretty perfect to me. 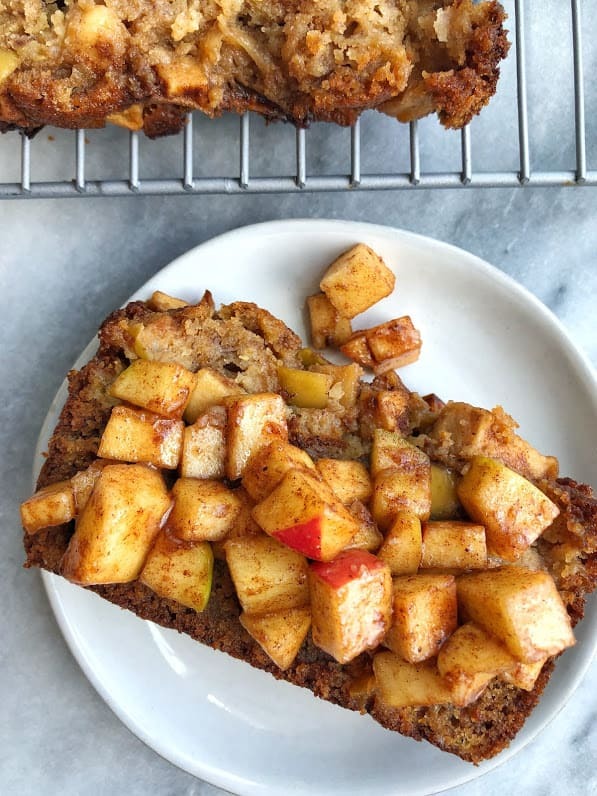 Move aside pumpkin bread, healthy apple cinnamon bread is here! For the topping, mix half of above cinnamon sugar mixture with 1 cup finely chopped apples (I used one Gala + one Granny Smith). In a small bowl, combine flour, baking powder, baking soda, and salt. In a large bowl, add mashed bananas, honey, oil, and vanilla. Stir to combine. 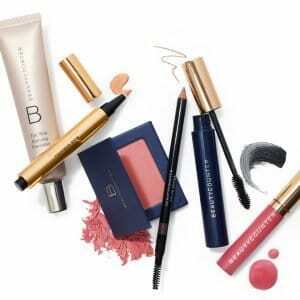 Fold dry ingredients into wet, stirring until completely combined. Pour half of batter into greased bread loaf pan. In a small bowl, mix coconut sugar, coconut oil, and cinnamon with a fork. Sprinkle half of cinnamon sugar mixture on first half batter. Pour remaining half of batter on top. Add apples to cinnamon sugar mixture and toss to coat. Sprinkle apple cinnamon sugar mixture on top. Bake in 350F oven for 40-44 minutes – using a toothpick to test. I took mine out at 40 minutes and it was done. Hi! I made this today with my daughter, and it’s delicious! I had to cook a bit longer because the batter under the apples was still wet after 45 mins. I did use a lot of apples, maybe too many! Yummy though, and fun to make with my 6 year old. Might try to make this into muffins next time. Thanks for a great recipe! Hi Rachel! Thanks so much for letting me know! My oven at home is very powerful so maybe I’ll add in some more time 🙂 I hope you enjoy them if you try muffins! Any way to make this grain free or flourless? You could try with almond flour – I would consider adding in another egg, though! I so want to try this recipe but grain free. Will a combination of almond and coconut flour work here? You should be able to make that work. I have a couple other bread recipes that you could use as a base. I made this loaf earlier today and I loved it! Planning to top it with pb and strawberries tomorrow morning. Thanks for sharing Audrey!! Glad you love it!